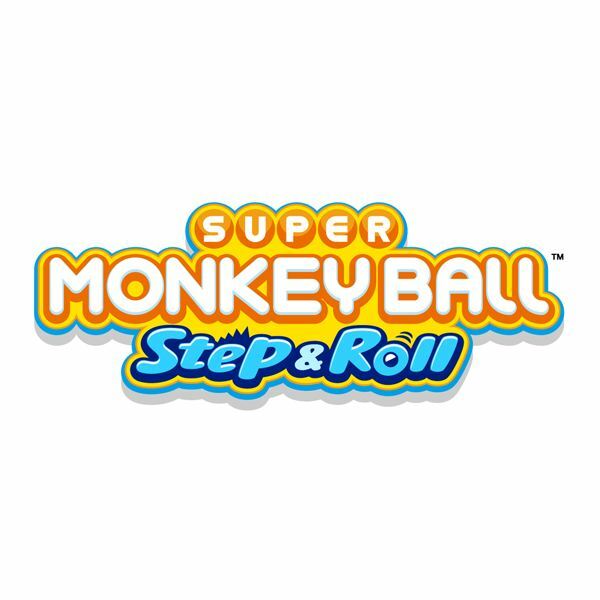 This Super Monkey Ball: Step & Roll Wii review will look at the newest game in the Monkey Ball series. The game mechanics are essentially the same as the other games in the series, but there are new levels and a couple of new twists which help keep the game interesting. To complete each level a player must try and get their monkey in a ball to the goal point within the specified time limit. As with the games before it the main portion of gameplay involves tilting each level so that the monkey in a ball can reach the goal without falling off the edge. Super Monkey Ball: Step & Roll takes it one step further by introducing the use of the Wii Fit balance board. The board can be used to move the ball around the course. The amount of weight placed on the board will determine the degree to which the course is tilted. Unfortunately using the board makes for a very uneven and rough playing experience. 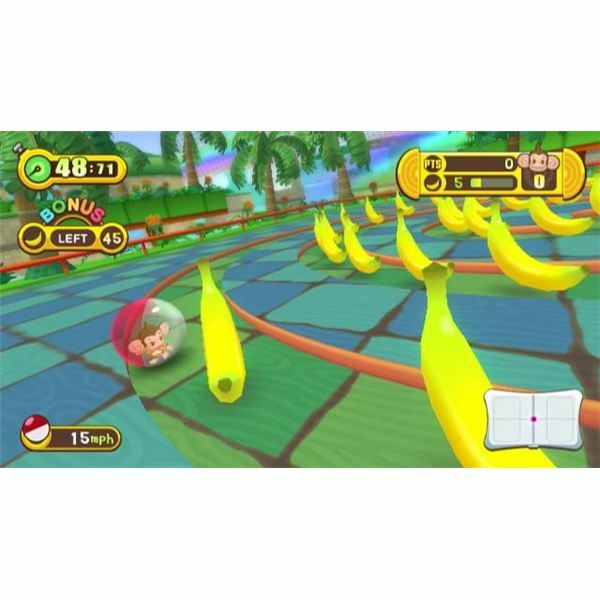 The creators of Monkey Ball admit that using the board is more difficult than the traditional Wii remote. That is why they removed some of the obstacles from the courses. The regular Wii remote and classic controller can also be used. Whichever controller type you choose will have an impact on gameplay. There are 70 levels that can be played through. These levels are divided into several unique worlds. There are no boss fights like there were in Banana Blitz. This is probably a relief for many, as they had a tendency to get tedious and annoying after a while. There are still bonus levels that can be used as a great way to get extra lives. Two bonus levels are located in each world. 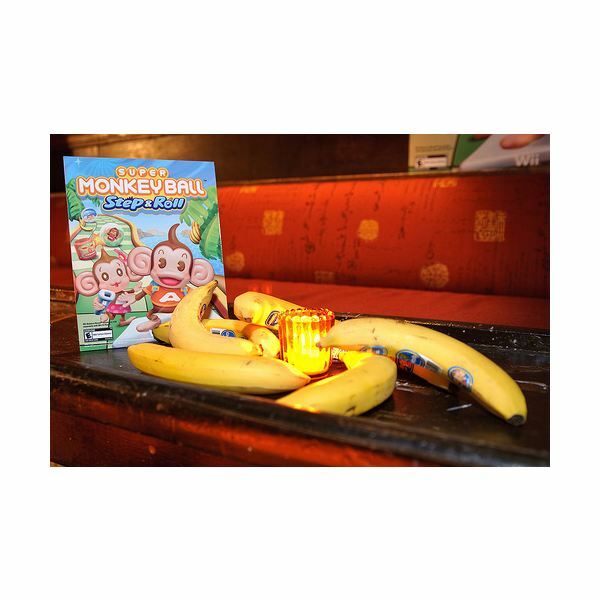 Bananas can still be collected as you navigate your monkey around the course. If you collect enough you will earn extra lives. There are also 21 mini games that can be played with a group of friends. These help add some lasting appeal, but many people will probably find that these mini games are only fun to try once or twice. There has been a big improvement in graphics since Banana Blitz. Step & Roll has smoothed out the graphics and improved the game’s overall presentation. They have also removed the lag and any frame rate issues that Banana Blitz often suffered from. The presentation is still a bit cheesy, but many people will not mind this. The menu has plenty of character and is very easy to navigate. The overall graphics and presentation give off an arcade type feel, and this will be very popular with fans of the series. The sound has improved a great deal since Banana Blitz. The music that is played in each level is unique and fun to listen to. Each level plays only a part of a larger song. Once all of the levels in the world have been completed players can listen to the completed song. This is a unique approach, and definitely improves the overall game experience. The user interface is quite good, but the controls in Super Monkey Ball: Step & Roll are very uneven at best. The use of the balance board simply complicates matters and is very difficult to maneuver. Even the classic controller or Wii remote can sometimes be difficult to use. There are many times when the monkey simply does not move where you intended it to; this can be very frustrating. The arcade style play of trying to move the monkey through the courses is a lot of fun and will bring players many hours of enjoyment. Unfortunately the multiplayer does not add the overall replayability of the game. The mini games are fairly dull and add very little lasting appeal as most will only be played once or twice. 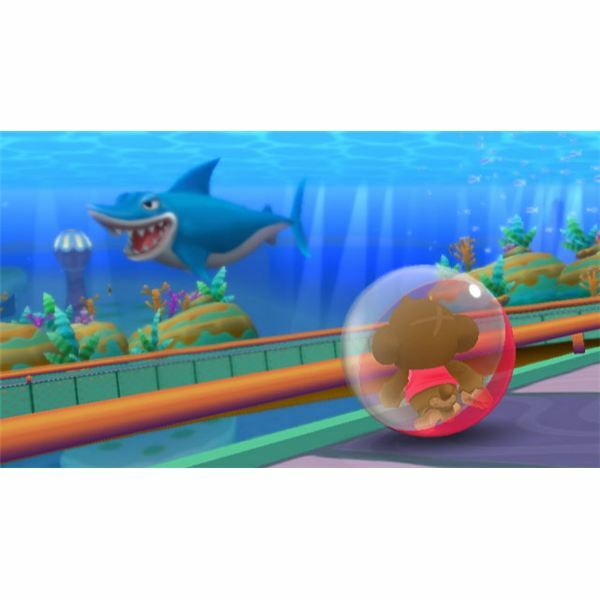 Super Monkey Ball: Step & Roll does not add anything new or ground breaking to the series. However, it did a good job of removing some of the gameplay annoyances such as the story and boss fights. The sound and graphics have improved, but the addition of the Wii board is not a huge selling feature. The controls are awkward and most people will prefer to use the regular Wii remote. Overall the game is quite fun, but by not offering anything new or earth shattering many players may become bored quickly.